2018 Personal Property Declarations are due Friday, November 1, 2018 The Assessor's office is responsible for discovering, listing and valuing all taxable personal property of businesses located in the Town of Hartland. 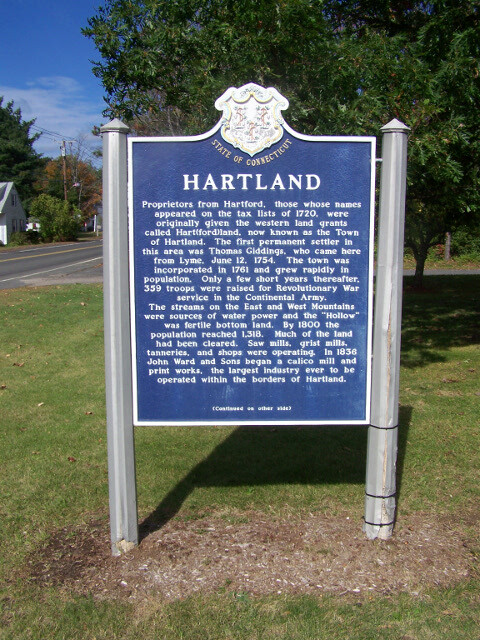 Personal Property Declarations are mailed every September to businesses located in Hartland including companies that have leased, borrowed or consigned equipment. The declaration contains detailed instructions in order to complete the declaration. Failure to receive a declaration does not exclude any business owner from filing a declaration. Declarations of property must be filed on or before the first of November by all businesses in the Town. Failure to file timely or omit personal property shall be subject to a twenty-five per cent penalty of the assessment. Declarations can be obtained from the Hartland Assessor's Office by calling (860) 653-0287, or by visiting the office located at the Hartland Town Hall, 22 South Rd., East Hartland, CT 06027.
Who is required to files a Personal Property Declaration? Any owner of a horse or horses. What must be declared to the Assessor's Office? All personal property items used (full or part-time) in the conduct of the business including items donated, given to you or owned prior to starting your business, unregistered motor vehicle(s), out-of-state registered motor vehicle(s) that is operated in Wolcott, or horses. 2. Section §12-41 (c) “… shall include, but is not limited to, the following property: Machinery used in mills and factories, cables, wires, poles, underground mains, conduits, pipes and other fixtures of water, gas, electric and heating companies, leasehold improvements classified as other than real property and furniture and fixtures of stores, offices, hotels, restaurants, taverns, halls, factories and manufacturers..."
What are goods, chattels and effects? Chattels: Any item that is movable or immovable property except real estate; an article of personal property. Effects: Personal estate of property; though the term may include both real and personal property. What are examples of "Personal Property" that I must declare? There are more examples on Pages 4, 5 and 6 of the Personal Property Declaration. I just do some work part-time. Do you really think I am a business? 1. Do you provide a product for compensation? 2. Do you provide a service for compensation? If you answered "YES" to Question #1, then you are in business. You are a business. If you answered "YES" to Question #2, please see the item "COMPENSATION" below. MONEY: It is not a question of how much money you are making or even if you are making any money. If you provide a product or service for compensation, then you are in business. You are a business. OWNERSHIP: If you have incorporated or if you have created another separate legal entity such as a LLC, LLP, LP etc to provide a product or service for compensation, then you are in business. You are a business. TRADE NAME: If you use a trade name to provide a product or service for compensation, then you are in business. You are a business. SELF-EMPLOYED: If you are self-employed, then you are in business. You are a business. COMPENSATION: If your compensation is reported through a W-2 then you are an employee, not in business or a business. But if your compensation is reported through a 1099 Form, or if there is no reporting of your income by any IRS form, then you are in business. You are a business. ASSETS: The amount of assets (personal property) used in the conduct of a business does not determine if you are in business. The amount of assets (personal property) used in the conduct of a business need not be many or even valuable. Depending upon the particular business you are in, the assets (or personal property) could range from a few hundred dollars to millions of dollars. ADVERTISING: If you are advertising a product or service for compensation, then you are in business. You are a business. RENTING SPACE: If you rent or lease a space to provide a product or service for compensation, then you are in business. You are a business. HOME OCCUPATION: Even if you do not rent or lease space, if you provide a product or service for compensation from your home, then you are in business. You are a business. SALES TAX: If you have a Sales Tax Number or if you collect sales tax, then you are in business. You are a business. TIME: You do not need to be providing a product or service 24/7 in order to be in business or to be a business. Some businesses are seasonal. Some businesses are part-time. Some businesses are very part-time. How do I complete the Personal Property Declaration? Instructions are on Page 2 of the Personal Property Declaration. Do I have to file a Personal Property Declaration every year? Yes. Declarations filed with “same as last year” are insufficient and shall be considered an incomplete declaration subject to a 25% penalty. A Declaration not filed shall result in a value determined by the Assessor plus a 25% penalty will be applied to the total assessment. When do I have to file the Personal Property Declaration? The Declaration must be filed annually no later than November 1st (or the Monday following if November 1 falls on Saturday or Sunday) (CGS §12-42). The 2016 Declaration must either be hand delivered, by 4:30 pm, to the Assessor’s Office no later than November 1st or have a U.S. Postal service (as defined in CGS §1-2a & as referenced in §12-41(d) postmark on or before November 1st. (Please note a postage meter machine in your office is not considered to be a U.S. Postmark.) All Declarations must be signed and/or notarized on page 11. When 2015 Declarations are filed after November 2Nd and an extension has not been granted, a 25% penalty is applied to the total assessment. Mailed Declarations must have a U.S. postmark of November 2nd or before. When an extension is granted and the Declaration is not filed by the extension deadline, a 25% penalty is applied to the total assessment. The Assessor may grant a filing extension for good cause. If an extension is needed, contact the Assessor in writing prior to November 2nd stating the reason for the extension. The decision to grant an extension is the sole responsibility of the Assessor. There is no appeal. What if I don't file the Personal Property Declaration? A Declaration not filed shall result in a value determined by the Assessor plus a 25% penalty will be applied to the total assessment. Does my signature need to be notarized? If you are a sole proprietor (that is, you personally own all the assets used in the conduct of your business) or you are one of the partners in a simple partnership (that is, your partnership was not created pursuant to the corporation laws of any state) your signature does not have to be notarized. As a sole proprietor or as one of the partners in a simple partnership, it is assumed that you have personal knowledge of the value of the assets used in the conduct of your business. However when the business is being conducted as a LLC, LP, LLP, PC, Corporation (Inc), Type “S” Corporation or some other separate legal entity or individual, it is necessary to have the identity, the authority and the knowledge of the signer sworn to by the notarization process. This is especially true when the name of the business is fictitious (i.e., when the name of the business bears no similarity with the name of the signer). Section 12-50 CGS allows an “authorized agent” to file a personal property declaration on behalf of the “taxpayer”. While you may be the “owner” of the LLC, LP, LLP, PC, Corporation (Inc), or Type “S” Corporation; it is the LLC, LP, LLP, PC, Corporation (Inc) or Type “S” Corporation that owns the assets used in the conduct of the business. Therefore it is the LLC, LP, LLP, PC, Corporation (Inc) or Type “S” Corporation that is the “taxpayer”. Thus when someone signs for a LLC, LP, LLP, PC, Corporation (Inc) or Type “S” Corporation, they are, in fact, signing as an agent of that LLC, LP, LLP, PC, Corporation (Inc) or Type “S” Corporation. Section 12-50 CGS also states, in part, such agent “shall make oath that he is authorized….and has knowledge of all taxable property…”. Thus an agent’s signature must be notarized because it is only through the act of notarization that an oath is made pursuant to Section 12-50 CGS and it is only through an oath that the Assessor can verify that the signer is authorized to be an agent and that he/she has knowledge of all taxable property as required in Section 12-50 CGS. The oath (as provided through the act of notarization) is an acknowledgment that the person signing personally appeared before the notary, that he/she has authority to provide the information that appears on that personal property declaration and that he/she has knowledge of all taxable property owned. NOTE: Failure to have the personal property declaration properly signed and/or notarized will result in a 25% penalty being applied to the total assessment. The Town of Wolcott Assessor’s Office does not accept electronic or faxed filings. Section 12-50. List may be filed by spouse, attorney or agent. The list of taxable property required to be filed annually by any taxpayer may be filed by the husband or wife or by an authorized agent or attorney of a taxpayer. Such husband or wife or agent or attorney shall make oath that he is authorized by the taxpayer to file such list and that he has knowledge of all taxable property of his principal subject to taxation in the town or municipality wherein such list is filed. perjury. In the case of an oath, the vow shall include reference to a Supreme Being. How is the Personal Property Assessment calculated? Your cost information is confidential and not open to public inspection. The original acquisition cost should include any additional charges for transportation and installation. The original acquisition cost less the standard depreciation (as shown on Pages 4, 5 and 6) will determine the depreciated cost. The total depreciated cost times 70% will determine the gross assessment for that particular category of personal property. Include all assets that may have been fully depreciated, written off, or charged to expensed but are still owned. Computerized filings are acceptable as long as all the information is reported in this prescribed format. If more space is needed, then attach additional pages to the Declaration. How is the original cost determined? The original acquisition cost should include any additional charges for transportation and installation. The cost of the asset should be the cost of the item as new. This cost should be an arm’s length value that has been neither discounted nor determine by an auction sale. When purchasing used equipment the value that is paid for the item is the depreciated amount not the original cost. What if I don't remember what I paid for these things? If you do not remember the item’s original cost, then estimate its current value and put that number on the current (first) year line in the appropriate chart that appears on pages 4, 5 and 6. What if I don't know what these things cost because they were gifts? If you do not know the item’s original cost, then estimate its current value and put that number on the current (first) year line in the appropriate chart that appears on pages 4, 5 and 6. Can anyone see my Personal Property Declaration? No. Your cost information is confidential and not open to public inspection. How do I appeal my Personal Property Assessment? A prescribed appeal form must be filed in order to appear before the Board of Assessment Appeals (C.G.S. 12-111). These forms should be available in February in the Assessor’s Office. Complete all sections of the Appeal Form as indicated. The Appeal Form must either be in the Assessor’s Office no later than February 17th at noon (Please note the closing time for that date). The Board of Assessment Appeals will meet in March. You will receive notification of your March appointment by mail. Please bring copies of any documentation that you want to submit to the Board of Assessment Appeals as they will not make copies for you. Either you or your agent must appear before the Board of Assessment Appeals and be sworn to answer all questions regarding this appeal. Failure to do so shall waive your rights to this appeal. If someone is coming in as your agent, a completed Affidavit for Agent must either be attached to the Appeal Form or presented at the time of your appointment. Forms for “Affidavit for Agent” are available in the Assessor’s Office. In April, the Board of Assessment Appeals will notify you by mail of its decision. If not satisfied with the Board’s decision, you may (within two months of the date of mailing of that decision) file an appeal with the Superior Court (C.G.S. 12-117a). If filing with the Superior Court, it is recommended that you have legal counsel. You may also file an appeal with the Superior Court without first appealing to the Board of Assessment Appeals (C.G.S. 12-119). If filing with the Superior Court, it is recommended that you have legal counsel.